How old were you when you took your driving test? Sixteen, maybe? Seventeen or eighteen? My brother Tom took his yesterday. He's turning 27 in three months. Luckily, he passed---can you imagine the humiliation of failing your driving test at 26, after you've been learning (on and off) for ten years? Way worse than failing at sixteen because you drove through a stop sign. Yeah, whatever, I drove through a stop sign the first time I took my driving test, don't make a big deal of it or anything. Come on! It was really hard to see where the line was! Before I tell you about my Christmas, which was excellent, I am going to tell you about my day after Christmas, which---if we are being authentic---I would call Boxing Day, for this is what English people call the day after Christmas, did you know that? I could be responsible and look it up on Wikipedia for you but instead I'm just going tell you that I think it has something to do with boxing up all the food you didn't eat on Christmas Day and giving it to the poor people....or, hmm, something like that. Yeah, you'd better just look it up on Wikipedia, I'm probably wrong. This is Charlie and Sadie wishing you a Happy Christmas, and if you don't celebrate Christmas, they're wishing you a really kickass Friday. 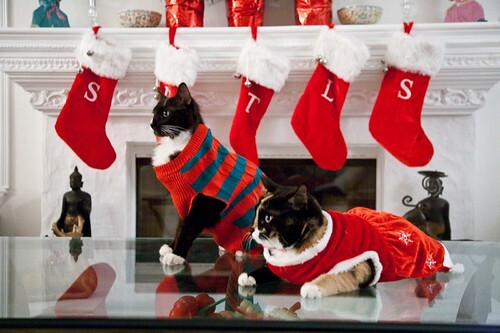 Charlie is wearing his handsome green and red striped holiday sweater---very big for 2010, according to his sources in Paris---and Sadie is wearing what her embarrassing mother and father cloyingly refer to as her "pretty pretty Christmas dress." 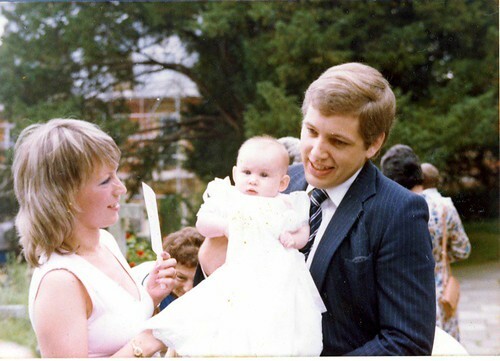 This is a picture of my Christening, where my parents look approximately twelve. (They weren't, of course, they were more like 29, but don't they look startlingly young?) My mother sent this to me the other day, not for the comic relief of me looking like a bald deer in headlights, nor for the hilarious glimpse of my grandma, peering through the gap between my parents while looking like she's searching for a dropped contact lens. In my parents' new house in San Diego, there is a bathroom without a door. Well, that's not strictly true, I suppose; there is a sort of archway dividing it from the bedroom. But if someone walked into that bedroom while you were in the bathroom, well, hoo boy, you'd get to know each other pretty quickly. If they were at the sink or in the bath, you'd definitely see them. If they were standing in the shower? Then you'd see a whole lot of them. I flew down to San Diego on Friday night to visit my family in their new home, and aside from the woman in the row behind me shouting "OH GOD, IT'S CRASHING, WE'RE ALL GOING TO DIE!" as the plane took off into some (admittedly) rather stormy skies, it was as enjoyable a weekend as I've had in a long time. Today my parents arrived in the United States. This in itself wouldn't be anything out of the ordinary if it weren't for the addendum I'm going to add on to that sentence: for good. Today my parents arrived in the United States for good.